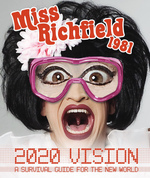 I can see clearly now that I attended Miss Richfield 1981's new show 2020 Vision: A Survival Guide For The New World at The Laurie Beechman Theatre in NYC! Miss Richfield knows in this post-election world, we're all living in the unknown, fearful of what tomorrow brings, but she is here to help us make it through...with laughter! I have seen Miss Richfield several times, but 2020 Vision really puts things in focus! With just one show left, tomorrow, Wednesday, 3/16, 2020 Vision is the perfect show to see!